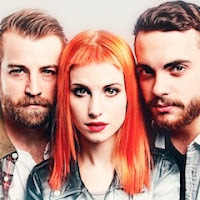 On their recent promotional trip overseas to the United Kingdom, Paramore dropped by the BBC Radio One Live Lounge to perform a three-song acoustic set, which included a stripped down rendition of their incredible ballad, "Hate To See Your Heart Break." You can watch Hayley and Taylor perform the track by clicking read more. Don't forget, the band's long-awaited new self-titled album drops on this Tuesday (April 9th) via Fueled By Ramen. Pre-order your copy now here.